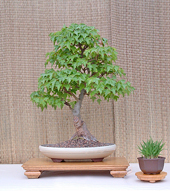 This is the beginning of the hot months of the year and are reasonably quiet months as far as bonsai work is concerned. Watering should be attended to carefully. During extremely hot dry days, you may want to water twice a day. Be especially observant of small trees in small pots as they may require even more frequent waterings. These may also be placed on trays of damp sand or gravel to improve the atmosphere around them. If the weather is reasonably dry, you may want to wet the foliage daily, especially on trees that are prone to Red Spider. Spring and summer months are the times when pests and diseases are troublesome. Be sure to check your trees closely each day, as early detection means very little ill effect on your trees. Aphids are particularly active during this time. Spray as required. Do not spray in direct sunlight. Infestations of scale can attack Elms and Maples. Check your trees thoroughly. For minor amounts, a cotton swab and alcohol will do the trick. For more severe infestations, spray with an insecticide containing diazinon or malathion. An oil spray, such as Neem, is also effective. Another malady that can be experienced in spring is needle cast on pines. Unfortunately, there is not much you can do about it this year, but to prevent it happening next year, spray in late July with a fungicide containing chlorothalonil (Daconil). Repeat the treatment through September, at intervals of 10 to 14 days. Place trees in direct sun. This is an air borne fungus and brown needles should be removed and destroyed. Japanese Black Pines are especially susceptible. I would like to know who has this problem, and how wide spread it is. As the sun gets brighter and hotter, many varieties of deciduous trees will benefit from being shaded from the afternoon sun. Trees will reach autumn with fresh, healthy leaves that will enhance their fall color, if they are not exposed to the extreme summer sun. If you intend to defoliate some of your trees, especially ficus varieties, this is the time for that process. Note that after defoliation has been done, the tree will not be using water at the same rate as before, so don’t fall into the trap of constantly wetting the tree as you go about your normal “summer” watering. Root rot may be the result. Cut the leaf petioles with clean, sharp scissors to remove the leaves. After two or three weeks the new buds will swell and produce a new crop of leaves. The result will be more numerous, smaller leaves, better branch detail and more vivid fall color. In extreme hot conditions, some misting will be beneficial. Trees grown for flowers or fruit should not be defoliated. Trees that have been leaf pruned are best wired at this time as the branches and twigs are more flexible than in winter or spring. It is also easier to style a tree without crowded foliage to contend with. Defoliation should only be attempted on healthy, vigorous trees. This is the month that you will carry out candle pruning on your pines. Continue trimming and pinching back new growth as it elongates and finger-tip prune varieties such as Junipers as the buds develop. As trimming and pinching is attended to, the pots should also be weeded. Weeds have vigorous roots and use valuable nutrients in the container.